we love fun breakfast recipes over at our house, and recently we created a new breakfast recipe which has now become one of our favorites . 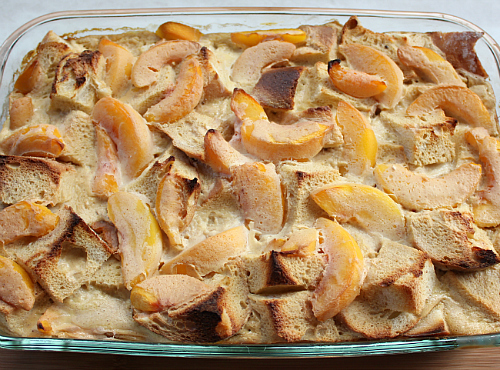 . . peaches-and-cream baked french toast. a few weeks ago, ryan and i were talking about food (a pretty common occurrence at our house) and the topic of baked french toast came up in our conversation. 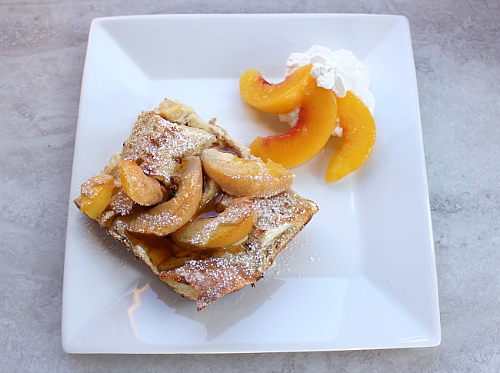 one thing lead to another, and we started constructing a recipe for baked french toast. i'll give ryan credit for thinking of incorporating the peaches. i'll take credit for thinking of incorporating the cream cheese. thus, peaches and cream . . . i call that good team work. this recipe kicks things up a notch on the french toast scale. 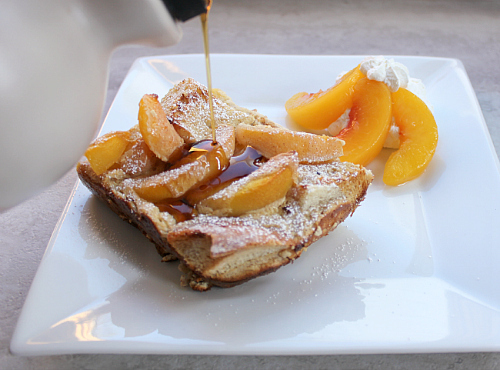 it is definitely not your grandmother's old-fashioned french toast. 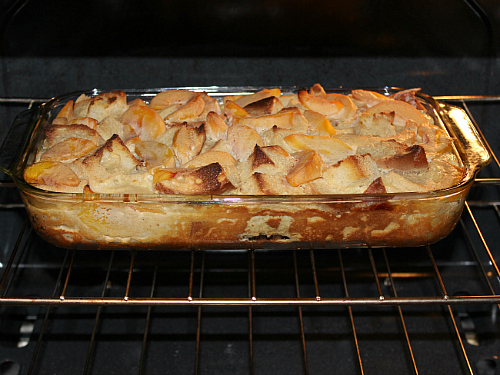 instead, it's almost like a french toast bread pudding. this dish can stand alone as a weekend morning breakfast, or it can serve as an awesome side dish for a brunch. it would be perfect for special occasions too. all of the work is done the night before, so when you wake up in the morning, all you have to do is preheat your oven and let it bake. it doesn't get much better than that! serve it at your next gathering, and you'll be a hit for sure! ps: today i'm guest posting over on angie's blog "this crazy nest" and sharing this recipe. be sure to check out my guest post here. cut the bread into 1 inch cubes and place the bread cubes in a buttered 9x13 inch glass baking dish. 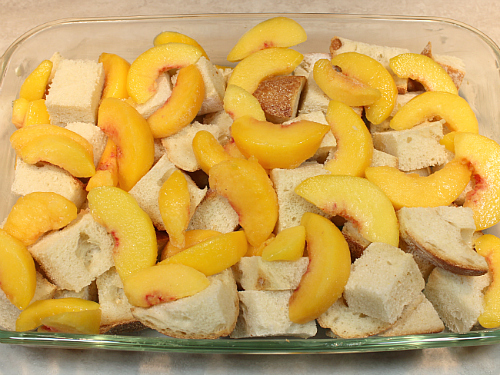 evenly spread the peach slices on top of the bread cubes. 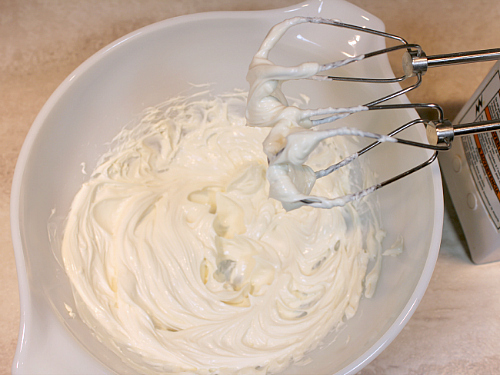 in a large bowl, beat the cream cheese until smooth with an electric hand mixer. add the sour cream, milk, brown sugar, and maple syrup. 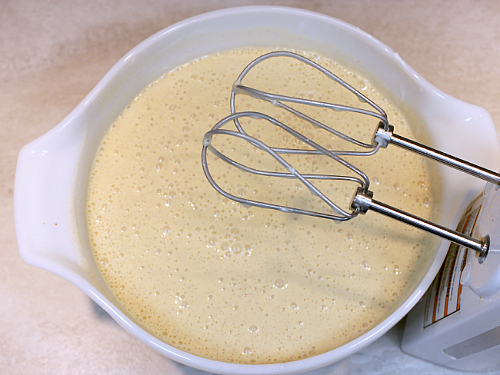 beat until all of the ingredients are incorporated and the sugar is dissolved. 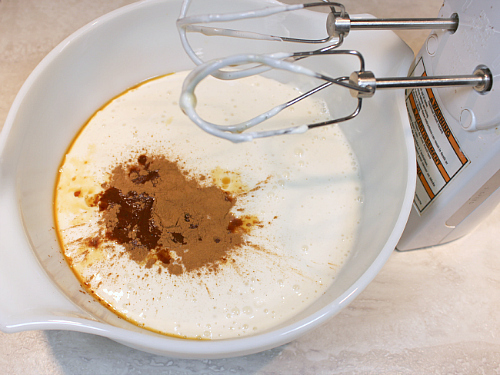 add the eggs, cinnamon, and vanilla. beat until smooth. 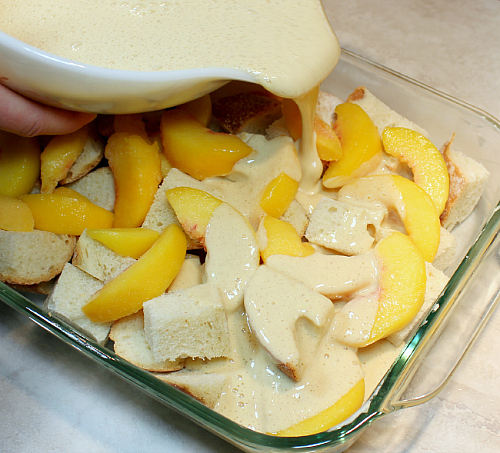 pour the mixture over the bread cubes and the peach slices. cover with aluminum foil and refrigerate overnight. remove from the refrigerator and allow the dish to sit on the counter for 30 minutes to come to room temperature. meanwhile, preheat your oven to 350 degrees F. bake covered for 30 minutes. 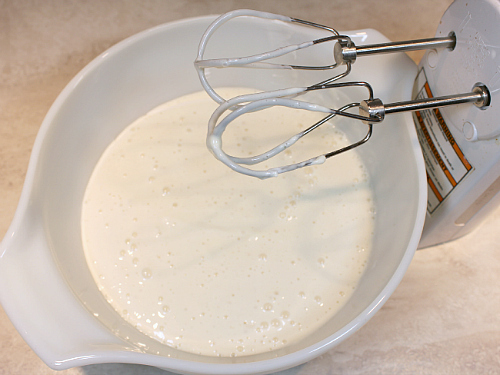 uncover and continue baking for an additional 30-35 minutes, or until there are no visible signs of liquid egg mixture. remove from the oven. allow the french toast to sit for several minutes to set up before cutting. serve hot, dusted with powdered sugar. 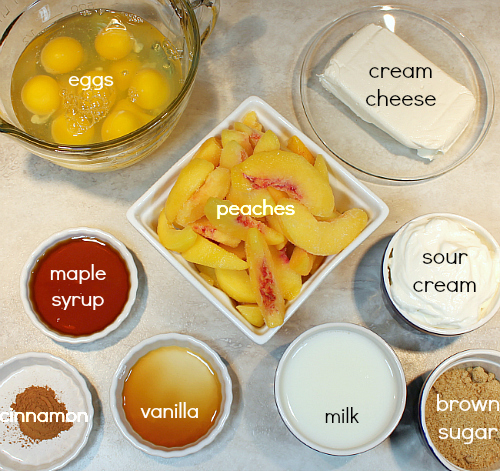 garnish with maple syrup, whipped cream, and additional peach slices. I love peaches. 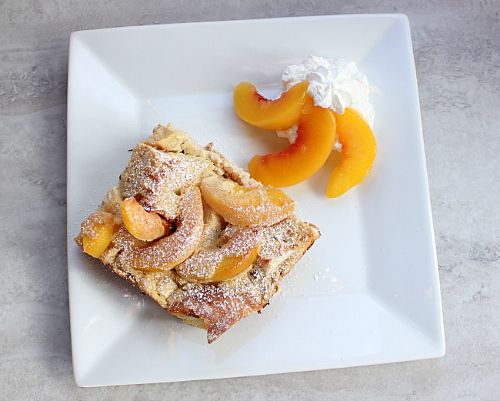 Add a little raspberries and it can become peach melba baked french toast. Wow, just wow. I could SO have this right now... for breakfast. That would be heaven lol. That first photo has my mouth watering!